Walt Whitman’s famous containment of multitudes may have influenced the organizers of the overstuffed Battle Hymns concert at Sanders Theater Saturday. Presented by the Harvard-Radcliffe Collegium along with the Boston Children’s Chorus and the Harvard Dance Project; it was part of Harvard’s Civil War Project, commemorating the 150th anniversary of the end of that national tragedy. Among the 21 constituent pieces were undergraduate compositions on texts by Oliver Wendell Holmes and the “Book of Job” (credited to Evan O’Dorney and Gus Ruchman, respectively), a handful of traditional songs, and an arrangement of “This Land is Your Land” performed by the Boston Children’s Chorus; adding a touch of secular ritual, we heard the tune of “The Battle Hymn of the Republic” serving four different texts, with the audience asked to stand and join in. Two “major works” formed the spine of the program: texts of Whitman’s set for guitar and chorus by composer Jeffrey Van, who performed on guitar; and three movements from David Lang’s Battle Hymns, hypnotic dismemberments of texts from Stephen Foster songs—we also got the Foster songs sung straight. Van’s work, entitled A Procession Winding Around Me, is in four movements, settings of the poems “By The Bivouac’s Fitful Flame,” “Beat! Beat! Drums!,” “Look Down Fair Moon” and “Reconciliation.” Drawn from Whitman’s collection Drum-Taps (later absorbed into Leaves of Grass), they sketch stages of a nation’s experience of war: anxious anticipation, violent destruction, horrific carnage, and healing. 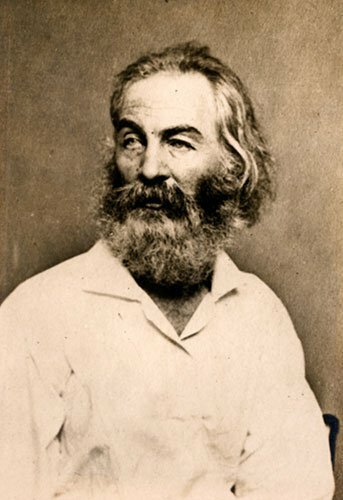 The composition is tonal and conservative, but it is always thoughtful and keenly attentive to Whitman’s language. Van was for decades a lecturer in guitar the University of Minnesota School of Music, and studied voice as an undergraduate as there was no guitar program. This dual training shows in the careful balance between the instrument and the voices. The guitar does not accompany the chorus so much as set the stage and provide the context for the poems. It also provides a hushed atmosphere in which unexpected sounds have surprisingly large impacts – when the player strikes the body of the instrument, it evokes cannon; when he hits the strings with his thumb rather than strumming them, you hear a deep drum. Once it has made its point, the guitar often remains silent, or gently provides harmonic hints to guide the ear. The vocal writing is often monorhythmic, the better to hear the words and the music Whitman has already written into them. The emotional range of the music is narrow and tends to the lyrical, even in “Beat! Beat! Drums!”, the most violent text of the evening. The entire evening was structured in the same way as A Procession Winding Around Me, the works grouped in four “acts” carrying the names of Whitman’s poems. This resulted in Van’s work being scattered across the program (as was Lang’s); this did not damage its reception. There’s no sense of journey in the settings, they are too alike; instead, one hears Van’s unassuming and self-effacing personality colored first this way, then that, by Whitman’s texts. It did no harm to allow the audience to return to his voice, rather than to issue all the movements at once. The Collegium, led by Andrew Clark, sang with passion, concentration and clarity; Van’s playing was understated yet colorful and presumably definitive. Lang’s work couldn’t be more different. He writes in a style that is clearly minimalist, though it is rarely soothing or entrancing. His use of texts is expressive and textural; most of the words printed in the program could not be heard, and some were returned to obsessively, losing meaning and turning into pure sound. Although all his texts were from Stephen Foster songs, there was little to connect the music to Foster, either in words or in music. The first movement,“I’ll be a soldier”, is based on the Foster song of the same name. It is a study in steady increase: the text is sung over and over again on a single pitch, with the notes getting faster and faster then stopping. Then it starts again. Over time the pitch rises, more voices join, and the pitches clash. Longer lines appear and the texture thickens. The voices begin to resemble trumpets, and the lasting impression is of military hysteria. “tell me”, based on fragments from Foster’s “Was My Brother in the Battle”, is more amorphous, the vocal lines beginning to keen as the work progresses. “beautiful dreamer” ended the evening on an unsettling note. The final piece in the “Reconciliation” act, it takes those two words and repeats them at great length. The vocalists are asked to audibly gasp when they run out of air. Those who are not singing the long notes are muttering the remainder of the broken texts. The piece begins unsettled and never resolves its initial discomfort. The performers spread out into the aisles of the theater while performing the piece, surrounding the audience with singing, low murmuring, and energetic exhalations. At his best, Lang creates sound worlds that disturb and hypnotize so much that the relative paucity of musical ideas is immaterial. This work isn’t his best but it served the theatrical needs of the evening admirably. The composer has authorized the addition of choreography to its performance, and the Harvard Dance Project was on hand to do so; I found the movement distracting, though perhaps those with less patience with music of Lang’s ilk were relieved to have something else to hold their attention. The Collegium was joined by the Children’s Chorus on “I’ll be a soldier” and “beautiful dreamer”; none of the performers seemed at all fazed by the unusual demands of Lang’s work. In fact, the Collegium risked being upstaged by the Children’s Chorus, directed by their assistant director Emily Howe. “Children” is a bit of a stretch – the performers all appeared to be of junior high and high school age, and their musical accomplishment is undeniable. While lacking the subtlety and flexibility of the older ensemble, they are possessed of a rich and powerful sound, and present a confident, even pugnacious attitude at times. Their performance of the spiritual “Deep River” was merely pretty; but their reading of Stephen Feigenbaum’s weirdly aggressive arrangement of “This Land is Your Land,” structured using an unchanging pattern that imprisoned the text in a fixed rhythm, was weirdly exciting. It didn’t really make sense next to “Beat! Beat! Drums!” but the occasional glower from the chorus at least gave it a sense of angry posturing. “Ain’t Gonna Let Nobody Turn Me ‘Round” provoked a few in the audience to clap despite having been asked to hold applause until the end of the evening. The conceit was a little creaky. Deep River really didn’t fit anywhere (it was shoe-horned into Act I), and the strangeness of “This Land” and “beautiful dreamer” have already been noted. Foster’s songs sat a little uncomfortably among the more ambitious works, though all of the various soloists delivered them competently. Van’s and Lang’s pieces had little to say to each other. But the generosity and passionate execution of Battle Hymns easily excuses the awkward earnestness of its structure. Battle Hymns was an embarrassment of riches. By contrast, the few songs offered at the end of Thursday’s discussion on the recent republishing of the original version of Drum-Taps (edited by author and composer Lawrence Kramer, who was present) hardly justified the 90+ minutes of disorganized and discursive palaver that preceded it. Nevertheless, the merely competent performance in Paine Hall by tenor Eric Perry and pianist Heinrich Christensen offered some interesting and unusual repertory. Kurt Weill’s version of “Beat! Beat! Drums!” starts out a bit rhetorically but turns into a regular juggernaut by the end. The same composer’s take on “Come Up From The Fields Father” doesn’t do much to improve a poem that was one of Whitman’s most sentimental. A fragment from Hindemith’s When Lilacs Last in the Dooryard Bloom’d (“Sing on, there in the swamp”) were much more affecting and touching than I recalled—enough to make one want to revisit the piece. There seems to be little composers can do but stand aside and dress these lines in a dreamy and dark tones. Naginski’s (an American composer of Russian heritage who died at the age of 31 in 1940) was an ABA form whose wordless outer sections were built around a wide-gapped ostinato, and whose middle section stated the poem directly to the audience. Rorem and Kramer’s pieces were more through-composed, Rorem’s texture recalling a chorale while Kramer’s was hushed and spare. To be complete, not all composers write the same way: if one attended Sunday’s concert with the Harvard-Radcliffe Chorale, one could have heard William Schuman’s trashy and insensitive manhandling in his cantata “A Free Song”. The mini-recital ended with also Kramer’s setting of “In Midnight Sleep.” Described by Kramer as a depiction of post-traumatic stress disorder, it felt sleepy and pallid. Perry has a subtle sense of the dramatic and a soft-edged voice that was best suited to the gentler expressions of the text. He was slightly overpowered by the piano at the start of the concert, which motivated the sound engineer to move a microphone in front of him. The resulting amplified sound was grating and positively unpleasant in louder sections. Perry may not have been able to hear what was going on, but it was appalling that no one else associated with the evening moved to put an end to it. See companion review here. See related article here. Re: Drumtaps presentation: The 3 speakers needed a moderator to exert firm control; one professor was not only a stage hog, but she also subjected the audience to a (mercifully) short video. The evening would have benefited by interspersing the sparser musical offerings with focused comments from the academics.